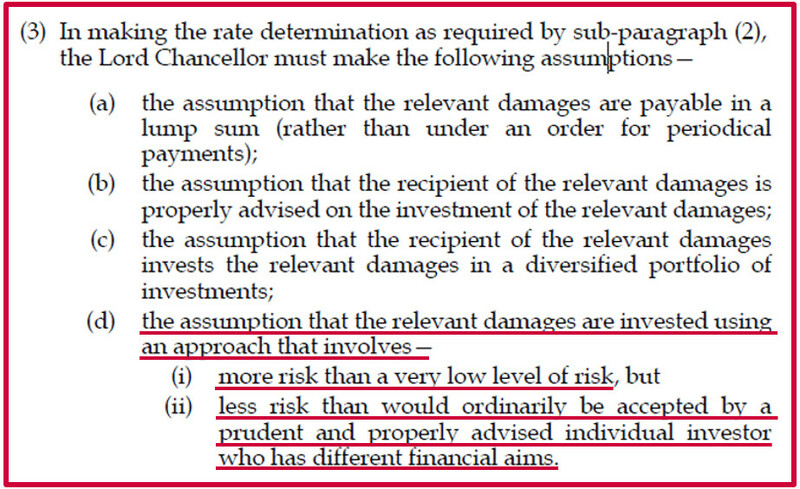 Once the first review has been published, the Lord Chancellor then has 140 days to determine an altered rate. Hypothetically, if the time limit for both ‘review commencement’ and ‘rate determination’ are exhausted, the latest date for setting the rate is 7 August 2019. In a previous edition of BC Disease News (here), we discussed that the former Lord Chancellor, David Lidington MP, had expected the revised rate to lie somewhere between 0% and 1%. It is foreseeable that such a prediction might materialise, as assumptions on investment risk have changed. Where the current rate presumes that claimants invest their damages at ‘very low risk’, the latest piece of legislation is less cautious. This will please the insurance industry, which has warned the Government about the risk of over-compensating claimants since the rate was drastically reduced from 2.5%, in February 2017, by Elizabeth Truss MP. In edition 254 (here), we reported that the States of Jersey would attempt to follow the Scottish Bill, by conferring power to the courts to impose a periodical payment order, as an appropriate alternative to a lump sum award, without the consent of parties. In the report, convener of the Holyrood Committee, Gordon Lindhurst, praised the flexibility of instalment-based compensation, but questioned ‘how ... [the Scottish Government] ... will promote the use of these periodical payment orders’. Furthermore, the report seeks additional information as to how the 30-year assumed investment period would be analysed and proposes that subsequent rate reviews should be undertaken by the Government Actuary every 5 years rather than every 3 years. If accepted, this would mirror the process set out in the Civil Liability Act. [i] Civil Liability Act 2018, pt 2 <http://www.legislation.gov.uk/ukpga/2018/29/pdfs/ukpga_20180029_en.pdf> accessed 3 January 2018. [ii] ‘Government sets clock ticking on discount rate reform’ (21 December 2018 Litigation Futures) <https://www.litigationfutures.com/news/government-sets-clock-ticking-on-discount-rate-reform> accessed 3 January 2019. [iv] John Hyde, ‘MoJ plans for discount rate change with call for evidence’ (7 December 2018 Law Gazette) <https://www.lawgazette.co.uk/news/moj-plans-for-discount-rate-change-with-call-for-evidence/5068629.article> accessed 7 January 2019. [v] Nick Hilborne, ‘MoJ calls for evidence on new personal injury discount rate’ (Litigation Futures 10 December 2018) <https://www.litigationfutures.com/news/moj-calls-for-evidence-on-new-personal-injury-discount-rate> accessed 7 January 2019. [vi] ‘New personal injury compensation law will deliver “fairness and transparency”’ (3 December 2018 Swindon Advertiser) <https://www.swindonadvertiser.co.uk/news/national/17271200.new-personal-injury-compensation-law-will-deliver-fairness-and-transparency/> accessed 3 January 2019.